Duke, the fourth-ranked team in the nation, dropped to 19-4 overall, and their ACC conference record is 7-3. Duke Head Coach Mike Krzyzewski was very blunt after the game, as he said, "I thought they made us look bad, but we made ourselves look bad. We didn’t play – we did not play basketball the first 32 minutes worthy of our program and we had blank faces. We didn’t talk. We were like five individuals out there, and it was disgusting really, and no matter what we said nothing worked with our team, until the last eight minutes, then we had a chance to win. Coach K said of St. John's, “The very first thing, congratulations to Chris [Mullin] and his team. They’ve been very involved in a lot of really close games in the conference. I know it’s been frustrating for them, but they came out and they were the better team today. [Shamorie] Ponds was terrific, but also they play with an enthusiasm and a togetherness that I’m sure they liked. It was tough for us to defend them." St. John’s Head Coach Chris Mullin said of breaking the team’s losing streak at The Garden, “We would have taken [a win] anywhere]. It was a very similar game, but we did a few more detailed things better. Not great, but better. We got a few clean rebounds after stops. To me, honestly, it feels much better to win of course, but it feels very similar to all these games that we’ve played. … I started to find myself saying the same thing over and over again [after games]. So to turn it around against one of the storied programs in college basketball is great. … It was more important for our players to get that taste back in their mouths. St. John's was led by Shamorie Ponds, who had 33 points, including 24 in the second half. He shot 12-23 from the field, including 4-8 on three-pointers and 5-7 from the free throw line, with seven rebounds, four steals, and three assists. This was Ponds' fourth game with 30 or more points, and second in a row as he had 31 points against Xavier on Tuesday in an emotional loss. Bashir Ahmed had 19 points, 13 of which came in the second half, on 6-10 shooting, 3-4 from behind the arc, with four rebounds and two assists. Tariq Owens had 17 points on 7-13 from the field, with four rebounds and two steals. Duke was led by Gary Trent Jr., who had 22 points on 7-12 shooting, a supern 5-7 from behind the arc, with two rebounds, two steals. He committed three turnovers, part of 18 for the team. Marvin Bagley III, who had 19 points on 6-10 shooting, including 2-4 on threes, with seven rebounds and two assists, while committing six turnovers. Wendell Carter Jr. had 14 points (3-6 FG, 8-8 free throws) and 15 rebounds for a double double, along with four blocks. Trevon Duval had 11 points (5-13 FG, 1-4 threes) and five assists, and committed four turnovers. The shocking thing on the day for Duke was the performance of Grayson Allen, who had just seven points on 1-7 from the field, 1-4 from behind the arc, and 4-6 on free throws, with two rebounds and two assists, while committing four turnovers. His season averages entering this one were 14.8 points and just under five assists per game. Duke started this game in control, and could have put it away early if they wanted to. Instead, they were on cruise control and built up a 10-point edge, 37-27, with 2:49 left in the first half, and took a 39-32 edge into halftime. Trent, Jr. had 14 points in the first half on 5-7 shooting and 4-5 on three-pointers, while Bagley III had 11 points. They had an edge at the half despite 12 turnovers in the opening frame. In the second half, St. John's opened with a 10-2 run capped by a Ponds three-pointer to make it 42-41 at the 17:01 mark. That lead ballooned to 52-45 on an Ahmed three at 14:12. St. John's eventually went up 59-50 at the 10:13 mark of the second half, and that was an elongated 32-13 run from when they trailed by 10 late the first half (37-27, 2:49). St. John's took an 11-point lead, 64-53, on a Ponds three-point play with 8:36 left. They maintained it over the next couple minutes when Owens got a layup to make it 68-57 at the 6:38 mark. Trevon Duval responded with a three and a layup to start a 7-0 run or Duke and pull them within 68-64 with 4:57 remaining. After Ponds made a jumper, Duval made a layup to keep it a four-point game, 70-66, withj 4:01 left. Down six with under three minutes left, Duval made a layup, followed by five straight points from Gary Trent, Jr., a three and a pair of free throws, to give Duke a 73-72 edge with 1:35 left. Out of a timeout, Ponds made a quick layup to give them back the lead at 74-73 with 1:19 left. Duke wasted no time to get off a shot on their ensuing possession, and Duval got to the line. Duval, a 60 percent free throw shooter, missed both. A big key in this one for St. John's was their offensive rebounding, as they had 16, and the most important one came off a Tariq Owens missed layup, and it eventually got to Ponds, who buried a three in the corner to make it 77-73 St. John's with just 40 seconds left. After that, Duke raced to the other end, and just four seconds later, Allen drained a three to bring them within a point, 77-76. Owens was fouled on the inbounds, and he made both free throws to make it a three-point game, 79-76 with 32 seconds left. Allen then missed a three, and Bagley was fouled after he snared the offensive rebound. Bagley, just a 62 percent free throw shooter, misses one of two, so it was 79-77 Red Storm with 20 seconds left. Ponds was fouled on the inbounds, and made just one of two free throws, keeping it a one-possession game at 80-77 with 17 seconds left. Duke responded with one of the sloppiest possessions ever, as they couldn't get set on the perimeter, and it wound up that Allen took a wild shot from behind the arc that barely got the rim with just eight seconds left. Owens got the rebound and dribbled the clock down to two seconds when he was fouled. He drained one of two free throws to seal the win. Ponds said of beating Duke, “We just stayed composed. We never broke or folded. We just stuck with our game plan and went into every game knowing we could win. The mindset was the same, we just tried to go out there and break the ice and today we did. We are happy but we can’t stop here, we have to keep pushing." 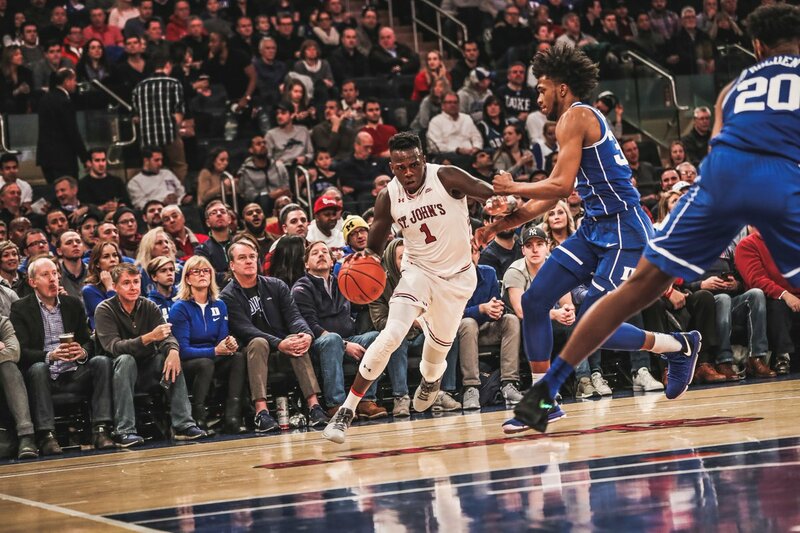 St. John's faces another huge test on Wednesday night, as they travel down to Philadelphia to take on the number-one ranked team in the nation, the Villanova Wildcats, who are 21-1 on the season, including 8-1 n the Big East.